The wings spread it to make them look bigger to the preditor. Your child was seen as the preditor. You have not had that bird long enough to interact with it. You need to ignore it and go on about your business until it can decide you are good people who will not eat him. You can talk to it and call it by name even if you change the name. You can sing to it or just talk about nothing when in the same room. You do not know how many demons this bird has had to deal with in it's like. Keep kids far away from any bird. They can seriously hurt each other. This is a good time for you to read up on diet and lighting. There is a whole section on it in the parrotforum. Basically just leave the bird alone. Give him a perch at your face level. They are not afraid of faces but hands can hurt them. Since all they have is the cage they are in they will defend it. Keep your palms down and talk softly when you have to go in the cage. No direct eye contact. If his wings are clipped he is double fearful. I am just the first to respond. Others with more knowledge will answer you soon. Welcome to the forum! Let me, first of all, clarify something for you: he hasn't bonded with you. It takes them much longer than a few days for this to happen. He is also, most likely, older than two. I don't know where you got him from and where you are located [geographically] but all large birds born in USA have leg bands with the year they were born engraved on them so check the leg band and see what year it says on it [it only shows the last two digits so, if he was born in, say, 2014, you will only see a 14 on it]. The reason why I think he is older is his aggression toward your child. He was not biting from fear, as Liz said. When a cockatoo walks over to a person with his wings half open like that [and I bet his beak was open, too], it's not fear, it's plain aggression - and it's always sexual hormones that caused it. And for this to have happened, the bird needs to have been already producing sexual hormones which, at two years of age, would have only now started so, for him to be so aggressive to 'competition' [I'll explain this below], he needs to be hormonal which means he has been producing sexual hormones for longer than a normal season. Now, I'll be honest with you, cockatoos and children don't usually mix. There is the uncommon [but not rare] exception to the rule that actually works out fine with children BUT this only happens when the bird is not producing sexual hormones, and cockatoos being what we call 'hormonal' birds, the owner needs to have IMPECABLE husbandry and the bird has to have lived under this impecable husbandry for over a year [because it takes up to four season for the endocrine system to go back on track after being messed up by the wrong light schedule and diet]. Let me explain. Cockatoos bond VERY deeply to humans and are HIGHLY jealous of the object of their affection to the point that they would attack anybody and anything they consider competition to their relationbship. 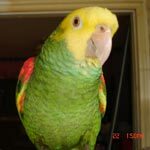 Birds that are overly-hormonal [this happens when people don't keep them the right way which, unfortunately, it's what happens to 95% of captive parrots] they would fixate on one person and attack everybody else. See, the thing is that although parrots are not naturally aggressive, they do defend and protect their mates, nests and babies so, when they see one person as the actual or potential mate [this is the way he sees you but it doesn't mean he will continue to regard you this way once he is no longer overly-hormonal], they make it their business to prevent anybody else from 'reaching' their chosen one. He /she doesn't like your daughter [and, most likely, he won't like anybody else, either] because he/she regards her as 'competition' -and this is something that you can't train out of the bird because it's hard-wired into their genes. This can be corrected BUT it will take impecable husbandry and months and months. First of all, he/she needs to be kept at a strict solar schedule with full exposure to dawn and dusk - this is ESSENTIAL and, if you cannot do it [anybody who works full time cannot do it], I would suggest you rethink the whole concept of owning this cockatoo because if this bird is bent on attacking your child within days of starting its honeymoon period, this is a bird that will need a lot of work. Secondly, he/she cannot be free-fed protein food -cockatoos need a high moisture diet with lots of produce and a limited amount of protein [higher than other parrots but still limited]. They also need an inordinate amount of time spent with their chosen human [and that means not less than 5 hours a day, every single day of the year, year after year] and HUGE amounts of chewing material as well as flight. Cockatoos are the number one given up bird and there is a very good reason for that - namely, they are very hard to keep healthy and happy. And, an unhappy too will scream and bite and might even pluck his feathers and self-mutilate. I have a Lesser Sulfur male that loves my female African gray, Sophie, and he is so jealous of her that, if during breeding season, he sees me looking and talking to her, he will rush over to watch what I will do next - and if she happens to fly down to my shoulder or arm, he starts screaming bloody murder and rushes over. I would keep the child away from the bird - I would actually keep the child in another room during the out-of-cage time [maybe while she is in school during the day?] and only allow her to give him treats when he is in its cage [but, please, make sure she keeps her finger far away from his beak because they can be tricky that way, they will make it look as if they go for the treat and bite the hand real quick]. And I would start the good diet and the strict solar schedule asap. This is a great time to do that because the days are getting shorter. I have encountered lots of bands that do not have the year. Id say that the majority do not. It's worth a shot looking, but I've been disappointed in how few give any useful info. Yes, you are correct, John. There are breeders that choose not to put the year on them because, this way, they can sell an older bird as younger [they also don't need to order bands every year]. It also depends on the state regulations... here, in Jersey, all large birds need to have a band with the year on it. But breeders will still cheat. This is still another reason why we need better bird laws! Its a very serious situation and fingers are the last of your worries, not if it gets a chance at your kids eyes. Parrots are single person pets and just do not do well in a family dynamic. Pajarita wrote: Yes, you are correct, John. There are breeders that choose not to put the year on them because, this way, they can sell an older bird as younger [they also don't need to order bands every year]. It also depends on the state regulations... here, in Jersey, all large birds need to have a band with the year on it. But breeders will still cheat. I had the bands cut off all my birds. There are enough hazards to birds. The band is just one more. I cut Rainbows band off many years ago. I did save it though in case that info is ever needed. Bands can be a problem but not necessarily. I wait and, if I see that the band is too loose or too tight or that the bird has a propensity for getting it caught somewhere, I remove it but I don't do it if there is nothing wrong with it because, if I have a rehome a bird, it's better if it has a band. I have birds that came to me without bands and now I am going to have to put microchips in them [something I do NOT like at all!] in order to get them into my country.